City of Perth Parking is once again thrilled to partner with Perth Glory for their 2018/19 season! We have a special parking offer available for Perth Glory season pass holders as well as casual match attendees. Glory fans can pre purchase a CPP “scratchie” parking permit, valid for parking at Royal Street Car Park on match days for up to 9 hours of continuous parking, starting 3 hours prior to kick off time. The pass holder simply scratches the date of the game they are attending, places the pass on the left-hand side of the vehicle’s front dash In clear view, secures their vehicle and off they go! Passes are available in 5 game or full 14 game amounts. 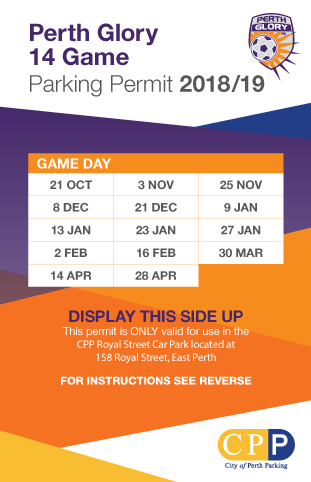 To purchase your Perth Glory Parking Permit, please fill out the form at the bottom of the page and one of our friendly Customer Service Representatives will contact you for payment details and for more information on the Perth Glory 2018-19 Season, visit www.perthglory.com.au. Sale of all passes are final and non refundable. Parking permit scratchies must be used in accordance with the instructions on the back of the permit. Failure to do so will result in an infringement which may not be revoked. The 5 game permit is valid for only 5 of the 14 games listed on the permit. Once the 5 days have been scratched, parking fees will apply. Care must be taken when selecting dates as additional days will not be provided should the wrong date be scratched. Permits are valid for 9 hours of continuous parking, starting 3 hours prior to the kick off time of the Perth Glory Game in which you are using the permit for; parking fees apply if you park for longer than the 9 hours. Terms and Conditions of car park use apply. Permits must be stored in a safe place. In the event that it is misplaced, stolen or damaged, you will be required to purchase a new permit. 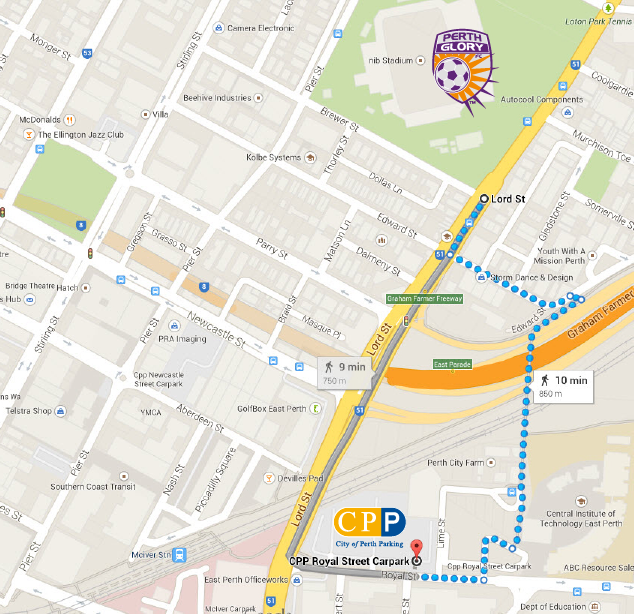 Royal Street Car Park is located at 158 Royal St, East Perth and is approximately a 10 minute walk from NIB Stadium. Please submit your details using the form below and a Customer Service Officer will contact you for your payment details.